Nike is the world’s top sports brand and dominates the markets of basketball, football, soccer, and track & field. It was always a surprise to me that they paid so little attention to the world of outdoor trail and mountain pursuits. With their budget and technology, it seemed like a no brainer to tap into the ever growing market of those who like to take on their outdoor adventures in style. Just a short while ago, Nike made their push onto the trail running scene with the Terra Kiger and Wildhorse. Both shoes are on their third iteration now, and the Nike Wildhorse 3 has been far and away my favorite overall trail shoe of the last two years. As I was racking up the heavenly miles on my Wildhorse 3, I thought I should give some of Nike’s other trail running kit a chance, and picked up the Nike Men’s Printed Trail Kiger Full-Zip Jacket when I found it on sale at the Nike Factory Store here in town. I’ve had a chance to take it out on a few hikes and runs now, and I absolutely love it. The Trail Kiger Jacket has become my ‘go-to’ layer for all fall outdoor activities north of 40 degrees. The first thing you’ll notice about the Trail Kiger is it’s style! This jacket jumps out at you, and I’m a big fan of the neon orange accents on the black and white digital pixelated print. The jacket has a “fit” cut, which I’m a fan of, as it hugs the waist nicely without any flapping or extra fabric. The pixelated print is a wind resistant ripstop material that does a great job of keeping the cool breezes off, without causing me to overheat. I’ve worn this jacket in a range of temperatures from 45-65F and it’s performed admirably across the range. What makes the jacket so breathable is the amount of stretch panels, which can be seen as the solid black fabric on the jacket. This runs under the arms and covers the entire back. I really appreciate this when hiking with a pack! The Trail Kiger has a hood that rolls up and buttons down if don’t like the feeling of the fabric flapping around in the wind. I’ve worn this hood in the face of a pretty stiff wind. I was very happy with the way the elastic around the face of the hood kept it on my head and free from movement. The wrists on the Trail Kiger have the same elastic lining, with just the right amount of hold. The fabrics used on the Trail Kiger are feather light, with my size M coming in at only 7.19 oz. This jacket also packs up very small, and takes up very little space in a hydration pack or backpack. I mentioned that this jacket allows for the hood to be rolled up and buttoned down, but that’s only the start to a list of the ‘bells and whistles’. The left chest has an absolutely massive zipper and cavity that fills the entire panel. I’m not exactly sure what someone would hope to store in there, but it’s large enough for another jacket! The two front hand warmer pockets are standard size and fit my above average sized hands rather well. The front right pocket has an internal zipper that allows you to store things like keys on the inside. The front left pocket has a pouch for a phone or music device and a slit for headphones. Both pockets are left stitched at the top, to allow for even more storage! I like to place gels or snacks here. You can tell this jacket was designed for the ultra runner, as there are tons of little pockets and storage options for just about anything you can think of! A nice touch for trail runners or hikers who wear running hydration packs, are the shoulder grips. I bought a Salomon jacket with shoulder grips back in 2012, and first thought it was a gimmick. After a couple of runs and hikes with it on, I realized the grips actually do keep the straps in place better than smooth fabric. The final design element I’ll cover here is reflective, since I know a lot of people will be looking at this for a night-time running jacket. Since this is a trail running jacket, there aren’t a whole lot of reflective elements, but the front Nike sign, and a reflective bar on the back have been added to help you be seen at night. 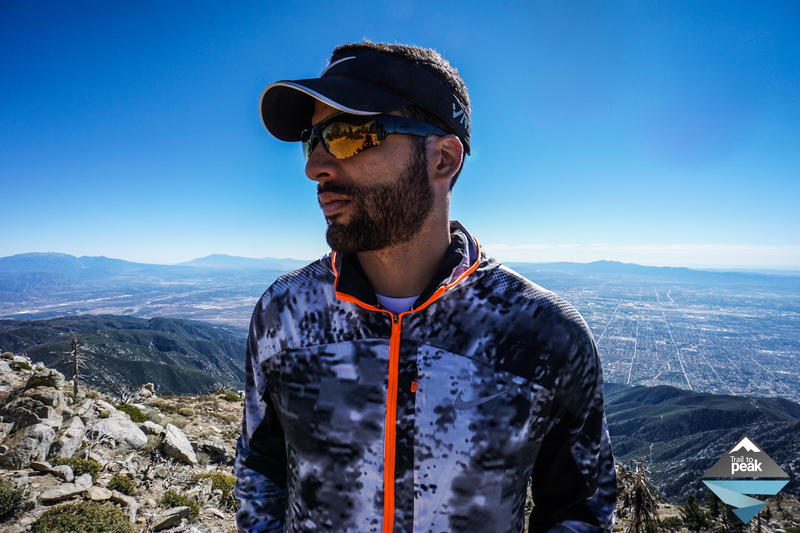 The Trail Kiger is an incredible jacket for trail runners and hikers looking for something warm, lightwieght, and packable. It’s not waterproof, but it does a decent job keeping the droplets off in a drizzle. The jacket is also very breathable and does a great job in many different temperature ranges. This is key when taking on adventures in the mountains, as the weather can change in an instant. The Trail Kiger has a ton of options for storage, with pockets and zippers galore. The Trail Kiger retails for $150 and can be found at Nike.com and a few major retailers. Always appreciate your reviews. Thanks! Just had a look for the UK and Blacks have it for £85 which is pretty decent. the pocket design sounds very clever, might take a visit to Blacks and have a look! That’s a really sweet deal. I was even more fortunate and found it for $35 at my local Nike Factory Outlet. I bought 3 of them!